The Irish manager was speaking at a press conference in Abbotstown today. 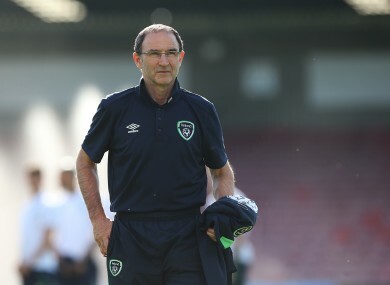 Martin O'Neill has come under fire for recent controversial comments. MARTIN O’NEILL HAS apologised for the comments he made during a recent Today FM show hosted by journalist Matt Cooper at the Cork Opera House. In remarks that were cut from the broadcast, as part of an ill-advised attempt at humour, O’Neill joked that coaches Steve Guppy and Steve Walford had also travelled to the Super Bowl earlier this year, along with himself and assistant boss Roy Keane, as he did not want people to think himself and Keane were “queers”. O’Neill’s use of the derogatory term was criticised by Kieran Rose, Co-Chair of the Gay and Lesbian Equality Network, in a Sunday Times article yesterday. And speaking at a press conference in Abbotstown today, O’Neill addressed the comments, saying he was offering a “genuine apology” for the remarks. “If I made inappropriate comments in the Opera House in Cork, I obviously apologise,” he said. It is not the first time O’Neill has caused controversy with an attempted joke. Meanwhile, Robbie Keane, Jon Walters and Robbie Brady are all still recovering from injury, though O’Neill was optimistic that each player would be ready for Ireland’s Euro 2016 opening match with France. O’Neill added that Keane, who trained this afternoon with strapping on his leg, felt he was making good progress with his recovery. In addition, James McCarthy — who has also struggled with injuries of late — took part in today’s session. Email “'If I made inappropriate comments, I obviously apologise' - Martin O'Neill sorry for 'queers' remark”. Feedback on “'If I made inappropriate comments, I obviously apologise' - Martin O'Neill sorry for 'queers' remark”.